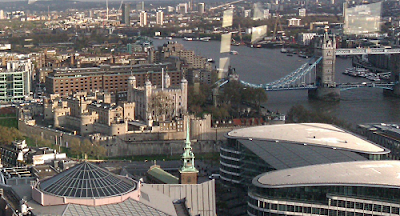 ‘Steytler Vision’ 2012 which is a new addition to the list at my favourite London restaurant. 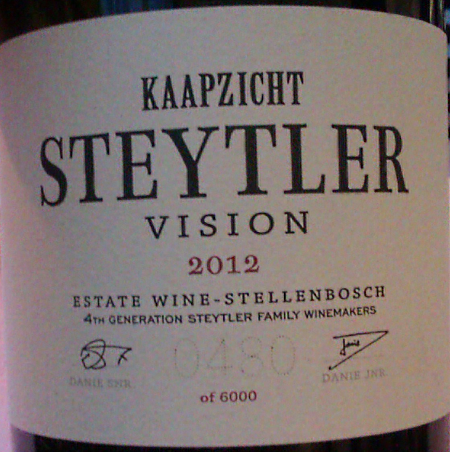 ‘Vision’ is a Cape Blend. 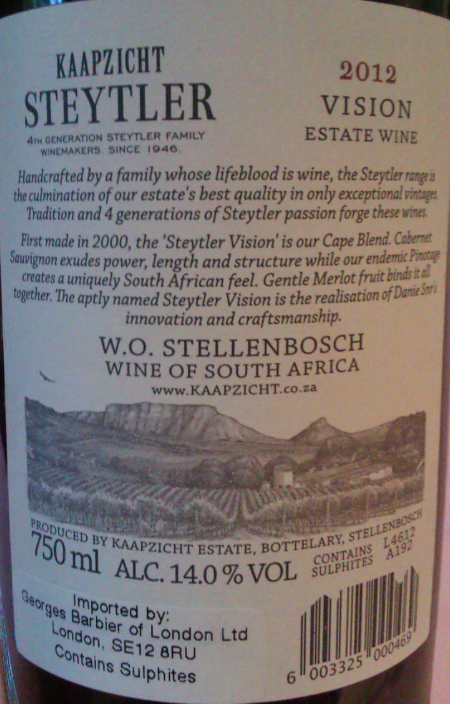 The 2012 is 55% Cabernet Sauvignon, 35% Pinotage, 10% Merlot (according to the website, no percentages shown on the label) vinified and aged separately in small French oak barrels for 28 months before blending together. The ‘Steytler’ label is reserved for Kaapzicht’s top wines, barrel selected by owner winemaker Danie Steytler, and now by son Danie Junior, fourth generation winemaker. Kaapzicht - literally Cape Sight - takes its name from the views of Cape Town harbour and Table Mountain that can be seen when you climb to the top of their vineyards. This wine is deliciously full bodied, silky smooth and with a core of sweet Pinotage fruit. It’s a magic blend, where the sum of the parts is greater than the component parts. 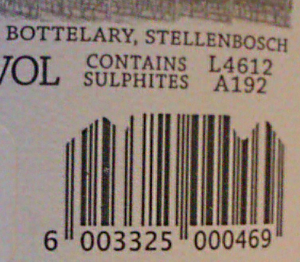 Nice quirky touch is the bar code rendered as an outline of Table Mountain, whose image has appeared on Kaapzicht’s labels through various designs over the years I've been buying them. 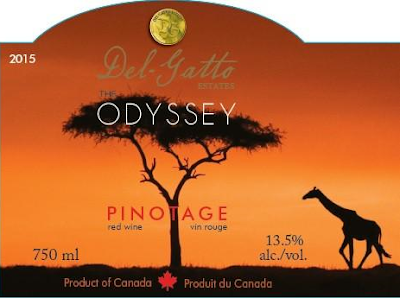 Del Gatto Estates in Prince Edward County, Ontario, Canada made their first Pinotage vintage in 2014. 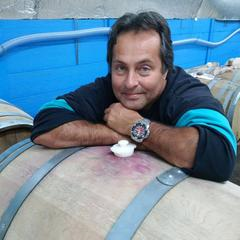 Pasquale (Pat) Del-Gatto is a fourth generation winemaker of Italian heritage, and with his family bought the 74 acre property in 2001. He researched potential vineyard locations in British Columbia, California and the Niagara region before choosing Prince Edward County as it compares in latitude and longitude to European wine regions. The estate is roughly 140 miles (225 km) east of Toronto on the shores of Lake Ontario. The Del Gatto family started planting vines in 2002 and now have 8 acres planted with nine hybrid varieties plus Pinotage. They produce small case lots of exclusive, premium quality white, rosé and red wines from their disease resistant and cold hardy vineyard, as well as an aged fortified port-style wine. California,” he said, “and came across a Pinotage wine event presented by South African producers’ first launch in North America. I was so taken by the characteristics of the wine that it became a pursuit. “When I started my vineyard/winery in 2002, I promised myself that I would find this vine and plant it. Finally in 2010 I sourced the bud wood and had a nursery make me young vines. In the 2016 vintage, not yet released, they produced two barrels. 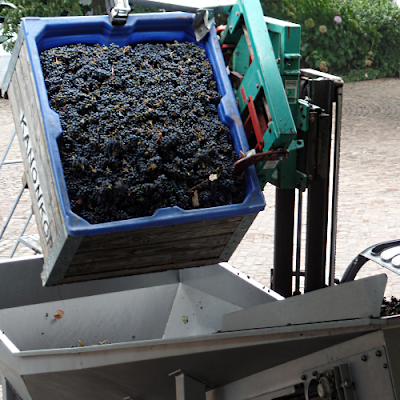 The 2015 vintage is sold out. Del Gatto Estates brings the number of Pinotage estates in Canada, that I am aware of, to four; the other three are in British Columbia on the West Coast. 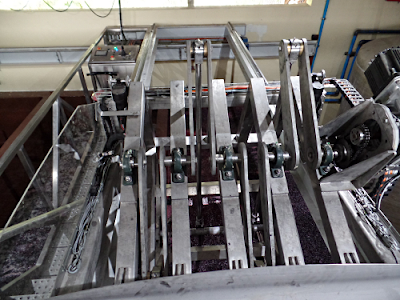 Kanonkop Estate is using robots to punch down caps. Winemaker Abrie Beeslaar tells me he was inspired by seeing mechanical ‘feet’ being used to tread grapes in the Douro when he visited Symington Family Estates’ Port Lodges. 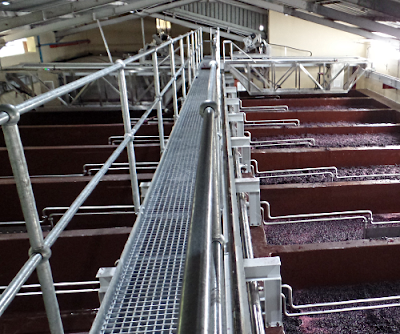 The success of the Kadette range, which uses grapes brought in from outside the estate, has necessitated Kanonkop constructing more traditional kuipes – the low open rectangular fermentation tanks. 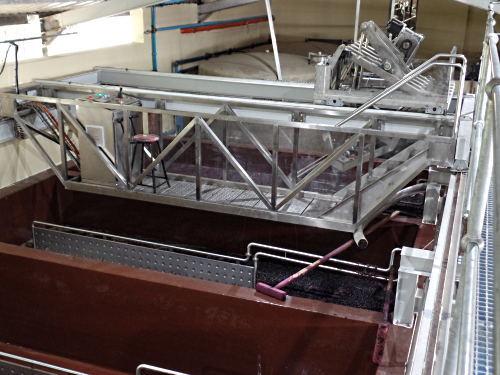 Up to now the 2 hourly pushing down of the cap of grape skins forced up by fermentation has been done around the clock by teams of estate workers. But the additional tanks were more than they could manage. The robots were designed by Abrie and constructed especially for Kanonkop. The machines move slowly on tracks above the kuipes while metal plates rise and fall, mimicking the actions of people pushing the cap down. 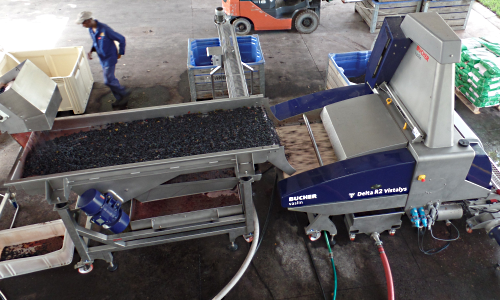 The machines are being evaluated and Abrie says the Estate wines will continue to be manually punched down. Abrie says his machines haven’t been patented and he’s easy going about other estates copying them. Another robot working the 2017 Kanonkop vintage for the first time is an optical sorter. 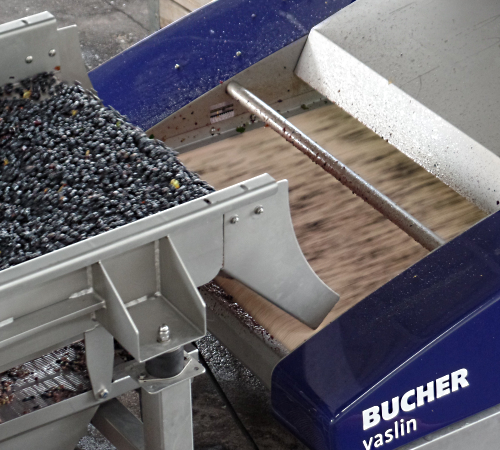 Bins of grapes are emptied into a hopper where they are destalked, they then pass along the first vibrating sorting table before dropping onto the high-speed belt of the optical sorter. Thanks to Heidi Kritzinger for her guided tour of the robots, tasting & etc. 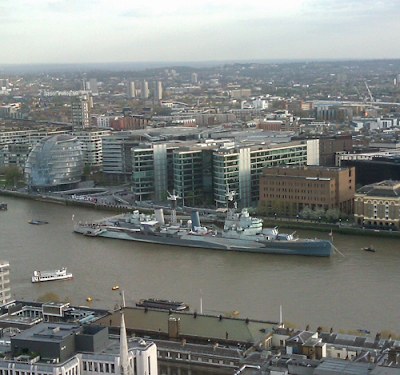 To the City to present a Pinotage tasting for Central London Wine Society held on the 23rd floor of the ‘Walkie Talkie’ building with fantastic views over London. 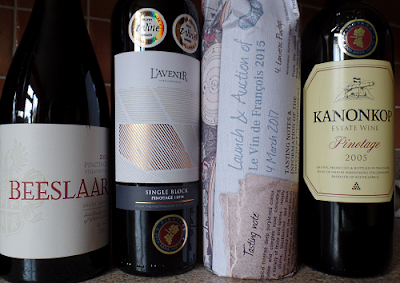 The tasting showed some of the many faces of Pinotage, from the light bodies 12.5% abv David & Nadia to the almost 15% Vin de Francis. There are interesting connections between the last four wines. 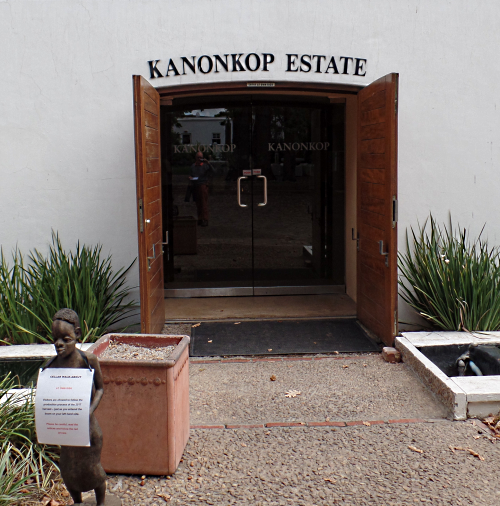 Beeslaar is owned and made by Abrie Beeslaar who is the winemaker at Kanonkop, which provided one barrel to Francois Naudé for his Le Vin de Francois. Francois Naudé planted L’Avenir’s Block 02 when he worked there as winemaker-viticulturist. That wine is dedicated to him and the vineyard supplied two barrels for Vin de Francois. The practise at CLWS is for attendees to score each wine at the end before prices are revealed. There was no great difference in the average scores, but Le Vin de Francois was the clear winner, followed by Kanonkop and then L’Avenir. I enjoyed them all, and was especially delighted by the fresh spiciness of L’Avenir’s Single Block 02 and the rich ripe body of Vin de Francois. 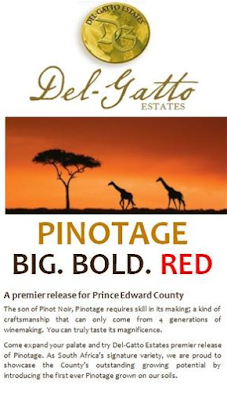 24 Oct 2017 - Pinotage - South African Wine Society - Toronto, Canada.